On Decatur Street, rain pours. It was raining when I woke up this morning. How appropriate. 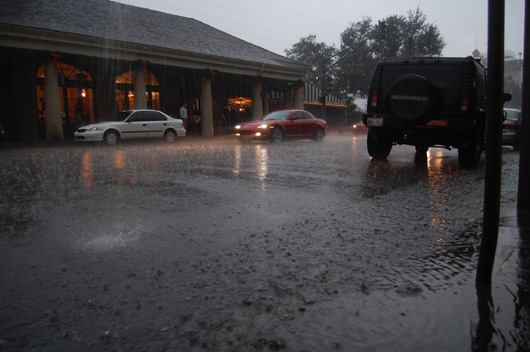 I often had wondered what Katrina's pelting downpour would have felt like, sounded like, looked liked. I'm guessing it was much worse than today's intermittent showers. Rain meant it was a good day for indoor activities. 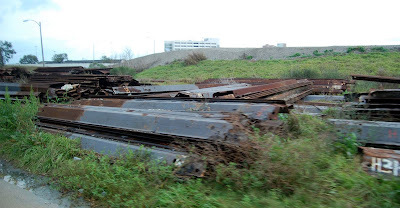 I had heard much about Gray Line's Hurricane Katrina tours. Mentions of them have popped up in several New York Times articles recently, and of course, the tour created quite a controversy when it began. How could someone profit off such destruction? If you actually take the tour, you'll see it's not so much of a profit-grabbing venture, but a massive public relations campaign for the city of New Orleans. And because it is operated by a private company, it's free publicity. But you have to be shrewd when interpreting the tour guide's remarks. Just as with any public relations endeavor, not everything in it is true - or at least, the truth is spun to make it look better. The 9 a.m. tour isn't too popular this time of year. Attendance will pick up with Mardi Gras and the football bowl games. But many tourists come to drink, and they're too hungover to be plunged into such an early morning bout of depression that the tour is. The 11 a.m. and 1 p.m. departures seem to draw more people. Four people, including myself, hop aboard the white tour bus, about the size of one of those mini school buses, but much more comfortable. Our driver is George. Our guide is Carole Stauber, a 60-something woman with gray hair and that thick Southern accent you would expect of any native New Orleanian. After her home in Jefferson Parish, just outside the city, was flooded with a foot of water, she was able to return eight months later and reclaim her residence. We start the tour on the French Quarter's Mississippi riverfront area, above. Stauber flips through a binder, shows it to everyone and points to architectural designs for past and future homes of the New Orleans area and to newspaper clippings, one of a Times-Picayune headline "Corps chief admits to 'design failure.'" "Katrina was not a natural disaster," Stauber said. "It was created by the Army Corps of Engineers," the federal employees who failed to protect the city from flooding. She says the tour was designed to dispel myths of New Orleans and of Katrina. Myth No. 1: New Orleans is below sea level. "No, it's not," she says. It's true that the entire city is not below sea level: The neighborhoods closest to the Mississippi make up the high ground (and escaped catastrophe during Katrina). But it's downhill from there, with many communities 10 feet or so below sea level. As the bus rolls down Canal Street, one of the main routes through the heart of New Orleans, Stauber points to the waterline stains on the concrete wall running parallel to the sidewalk. It's only a few inches in the French Quarter, but it increases to eight feet as we approach the now-shuttered medical services building of the LSU Health Sciences Center. Around this area, dozens, maybe hundreds, of homeless people are curled up under an expressway overpass. Some have tents. Some have blankets. Some are just fortunate to have the clothes on their backs. Traveling down Poydras Street and past the Louisiana Superdome, Stauber talks about how the National Guard tried to keep everyone in line at the stadium, where there was "some gang activity, stabbings, a suicide." Some businesses are boarded up. Some are covered with scaffolding. Some are for sale. Some are just piles of rubble. As we head over the expressway under which the homeless congregate, we see the first of many panoramic views. "Everything from this vantage point was flooded," she says through a microphone. The homes below the highway were missing roofs and walls. But many were just swept away in the deluge. We pass the above-ground St. Louis Cemetery (the superterranean coffins are a Mediterranean tradition that New Orleanians follow, Stauber says), then we see the 17th Street Canal in the upscale, mostly white residential neighborhood of Lakeview. During Katrina, the canal breached (above, now repaired), and Lakeview flooded. Homes are being jacked up or hoisted by cranes, and 8-, 9- or 10-foot stacks of cinder blocks are placed underneath. Sometimes the stilts are wood, above. This proactive approach to reconstruction and flood-proofing homes is almost as ugly as the wreckage itself. The stilted homes look unnatural. Then the bus stops, and Stauber explains the markings on a building. "AZ" and "9/8" mean it was searched by a crew from Arizona on Sept. 8, 2005. "HD" and "2" mean two human deaths. The sign by the Pontchartrain Baptist Church dissents from Stauber's view of the Army Corps of Engineers. "God bless the Corps," it says. The church is intact, no doubt rebuilt. But homes around it are in disrepair. "This wooden home floated when the flood wall broke," Stauber says, pointing at a pinkish-purplish house that looks like a baguette that was partially broken at several points, above. "The owner just left it there, with everything in it, to make a statement to the Corps." We ride past stacks of 73-foot sheet pilings that will replace the 15-foot pilings that once formed a useless wall between the homes of Gentilly, a demographically mixed neighborhood, and the London Avenue Canal. Stauber speaks about her friend Dotty, a resident of Gentilly who had to break a window to enter her home because the mud that settled inside blocked the door from opening. A message spray-painted on a house says "Lisa + Donnie R OK." Stauber says one tour group met Lisa and Donnie one day, as they inspected their home. The tour guide learned recently, however, that they would get a divorce. "Katrina stressed a lot of people," she says. Holes in roofs show where people chopped through as floodwaters rose into their attics. Shopping mall after shopping mall are closed. For the few people left in the ravaged neighborhoods, there is no grocery store nearby, no Wal-Mart, no Sam's Club, no Winn-Dixie. They're boarded up. On the bright side, Stauber says one neighborhood does have a seafood market, where po' boys are sold. The po' boy is a simple sub sandwich made of French bread stuffed with meat, most popularly fried shrimp. "Why do they call them poor boys?" a passenger asks. "Well, they always used to sell them for a nickel apiece to keep them poor boys fed," Stauber answers. "I've never liked them," the man says. "Too much bread." "We love our po' boys," Stauber says, clearly offended. We pass trailers that the New Orleans Police Department use as stations. We pass roofs covered with blue tarps. If you have ever checked Google Earth for images of New Orleans, below, and wonder why so many homes have blue roofs, that's why. Tarps were used to cover leaky roofs in a somewhat haphazard effort to prevent further water damage. We pass one neighborhood that was unscathed, even though several feet of water flooded it. "These homes were built at the turn of the century," Stauber says. "They were smart back then. Each one of them has a raised basement." As we pass over another a high expressway overlooking ships and freight cranes in the harbor, Stauber touts, "By the tonnage, New Orleans is the largest port in the world." Heavy automobile imports contribute to that. More good PR. She also mentions Louisiana's status as the largest domestic producer of offshore natural gas, something that each year contributes to the 30 square miles of disappearing wetlands on the Louisiana Gulf Coast. Less land allowed Katrina to move inland without much resistance. We pass the former Six Flags amusement park in New Orleans East. The company vowed never to reopen. We pass hundreds of 8-foot-high pink boxes, above. Courtesy of actor Brad Pitt and his Make It Right NOLA project, the "pink city" art exhibit represents the wreckage strewn about the landscape around the Industrial Canal. It's a fundraiser to pay for homes of victims left without one. We pass boats, above. They're littered throughout the swampland alongside the highway that runs through New Orleans East. The cypress trees that once fortified the Mississippi River-Gulf Outlet canal (abbreviated MRGO and pronounced by many as "Mr. Go"), above, were killed by the saltwater that rode in with Katrina's storm surge. MRGO was constructed to provide a shorter route from the Gulf of Mexico to New Orleans' inner harbor. And though the Corps has plugged holes in the levees and engineers continue to devise pumping systems as Amsterdam did in the Netherlands, New Orleans will never be 100 percent safe. Stauber touts the space program and the pivotal role that NASA's New Orleans location, the Michoud Assembly Facility, will play in the production of Ares I rockets, the next phase of space flight and missions to the moon and mars. This slightly irks anyone from Brevard County, Fla., home of NASA's Kennedy Space Center. So I'm slightly irked now. 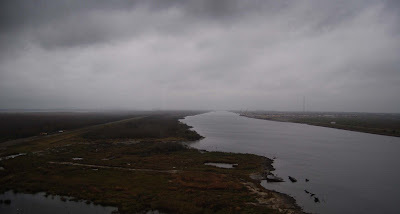 But as we pass through Chalmette in St. Bernard Parish and the Lower Ninth Ward, above, in New Orleans, Stauber and the passengers are fairly silent. Gray Line saved the worst for last. There are no words to describe the destruction. Most homes are uninhabitable and never will be again. They remain much the way Katrina had left them. Stauber thanks everyone for contributing to the New Orleans economy and for tipping her and the driver, George. She says that if were to take one thing away from the tour, it should be to spread the word of the harsh realities residential New Orleans is living with today. "Don't exaggerate. Don't make anything up," she says. "Tell them the truth." Video: From Chalmette, La., in St. Bernard Parish to the Lower Ninth Ward in New Orleans, see Brad Pitt's artistic statement, look at the wreckage of homes left in Katrina's wake and check out Musicians' Village, a hint of hope for the Crescent City.